Los Angeles (July 18, 2018) – Two highly anticipated sequels, “Mamma Mia! 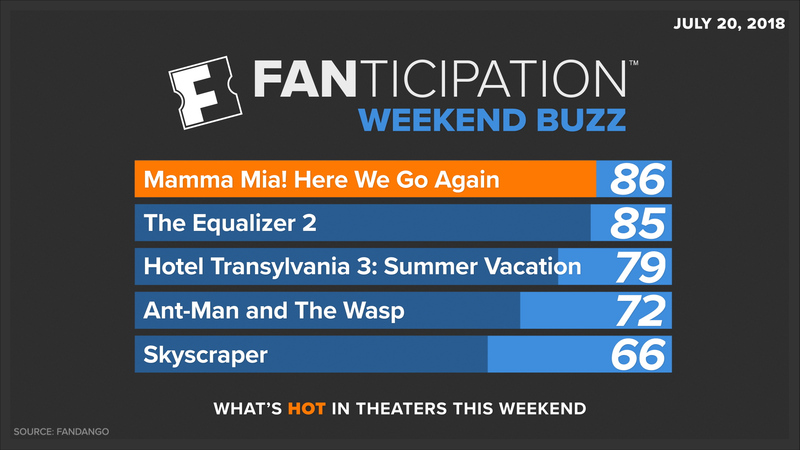 Here We Go Again” and Denzel Washington’s action-thriller, “The Equalizer 2,” are ruling Fandango’s weekend ticket sales and Fanticipation movie buzz index, garnering 86 and 85 points out of 100 Fanticipation points, respectively. “Mamma Mia! Here We Go Again” is outpacing previous movie musicals, “The Greatest Showman” and “Pitch Perfect 2,” in advance ticket sales on Fandango, while “The Equalizer 2” is outpacing the original “Equalizer” at the same point in the Fandango sales cycle. 88% are excited about the return of movie musicals to the big screen. 88% would like to visit the film’s exotic locations. 86% are curious to discover how Meryl Streep appears in the movie. 81% are excited by the new ABBA songs on the soundtrack. 80% are looking forward to Cher’s appearance in the movie.